Sign up to receive my email newsletter and access exclusive printables! One fall trend I can get on board with – pumpkin. I worked up this recipe a few days ago and it was a hit…hope y’all love it! Put 1 cup of the white chocolate chips, 2 tbsp of the evaporated milk, and 2 tbsp butter in a microwave-safe bowl and microwave for 30 seconds. Stir, and microwave in 10 second increments until chocolate is smooth. Meanwhile, mix together the pumpkin puree, eggs, remaining evaporated milk, salt, cinnamon, brown sugar, and vanilla in a large bowl. Add a little bit of this mixture into the chocolate mixture and stir until smooth (this tempers the chocolate so you won’t scramble the eggs). Now, mix the pumpkin mixture and chocolate mixture together. Pour everything into a 9×13 Pyrex dish and bake at 425 degrees for 15 minutes. Reduce heat to 350 degrees and bake for 30 additional minutes. Mix 1 cup mini marshmallows, remaining white chocolate chips (1 cup), remaining butter (2 tbsp), and 1/4 cup milk together in a microwave-safe bowl. Microwave 30 seconds, and then in 10 second increments until smooth. Pour this mixture on top of the baked pumpkin mixture. 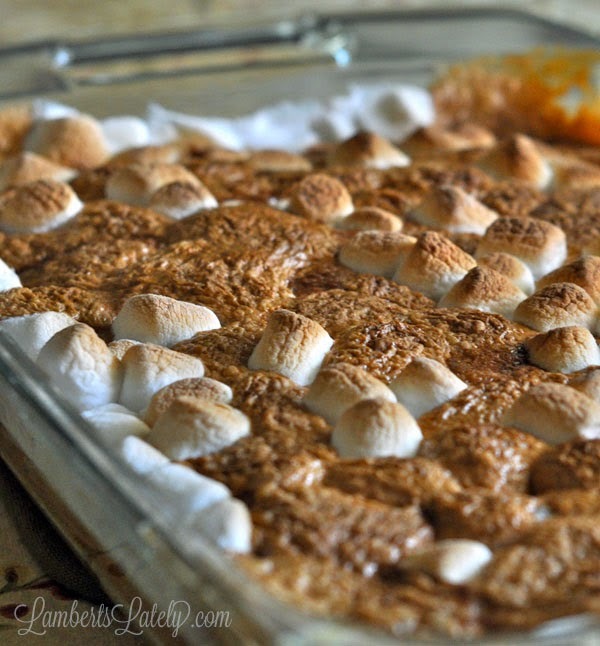 Top with Pumpkin and white marshmallows. Bake for 10 more minutes at 350 degrees. For the last minute or two, turn the broiler on to brown the marshmallows (watch this closely – they can burn very easily). Serve warm with graham crackers for dipping. WANT THE LATEST RECIPES FROM LAMBERTS LATELY? Subscribe to get my latest content straight to your inbox. You'll also receive exclusive access to my collection of printables! So yummy, but need advice on how to store it. Also, there are various sizes of pumpkin puree and evaporated milk. How many ounces were the can you used. My daughter guessed and made it, but we don’t know if it was the consistency it was supposed to be. Thanks!! Hi Michelle! You’ll be using the 15oz pumpkin puree and the 12oz can of evaporated milk. And I just store in my glass baking dish in the fridge! Perfect. Thank you so much!! What an amazingly delicious treat, I love it, and can’t wait to try to make this dip. I'm so glad you're here! Lamberts Lately is a place to share my greatest passion: home. I love to discuss food, family, travel, parenting, productivity, and the occasional battle story. Want to learn more about me? Click here!